Photograph of Vaishno Das Bagai in his general store in San Francisco, taken in 1923. Photograph of Vaishno Das Bagai in his store in San Francisco taken in 1923. A photograph of Vaishno Das Bagai and others. A handwritten note on the back of the photograph identifies others in the photograph, including Ramesh Chandra, Abnashi Ram Premi, and claims the picture was taken in the early 1920s. Copy of Complaint and Summons in V.D. Bagai vs. C.R. Badger, et al. Copy of Complaint and Summons in V.D. Bagai vs. C.R. Badger, et al.. A newspaper clipping is pasted onto the copy, which reads, "The creditors of C.E. Herrick, Incorporated, a concern which lends money on real estate and automobiles, petitioned yesterday to have it declared bankrupt. V.D. Bagai, the Isaac Upham Co. and the United States Fidelity and Guaranty Company are the petitioners." 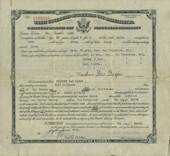 Certificate of naturalization for Vaishno Das Bagai, issued on March 7, 1921 in San Francisco. Photograph of Badri Das Bagai, brother of Vaishno Das Bagai. The back of the photograph contains the following description: "Uncle Badri Das (my uncle - Papa's older brother)." Letter from American Consular Service to Vaishno Das bagai, dated December 15, 1920. The letter reads, "At the request of the Deputy Commisioner of the Northwest Frontier Province, Peshawar, I send you herewith certificates regarding your nativity."